With the win, India levelled the three-match series 1-1. Kohli was named the man of the match for his 104, his 39th 100 in one day cricket. 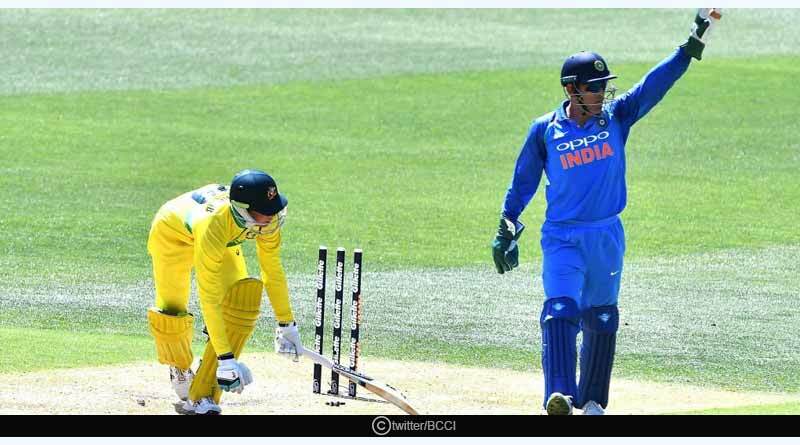 Going ahead with Australia Vs India Second ODI, guided by one of the finest second innings batsmen to have ever taken to the cricket pitch, India sealed a six-wicket victory in the second ODI against Australia at the Adelaide Oval. Having been set a stiff 299 to chase down to level the series, India rode on captain Virat Kohli’s riveting effort of 104 to knock down the target in 49.2 and with that get a favourable result in what was a must-win encounter for the side. It’s all to play for, for both the sides in the series decider on Friday, January 18th. Winning the toss and opting to bat first saw Australia win the first battle of the day on an Adelaide Oval pitch that saw just 6mm of grass on it, considerably trimmed down from the test series. It was a track made in heaven for the batsmen, one that assured a plethora of runs and for India, it was going to be an extremely uphill task to restrict Australia to a respectable total under sweltering conditions. What proved to be a difficult task for the tourists turned out to be an extremely well-rounded first power play for them with superbly controlled bowling from the opening pace duo of Bhuvneshwar Kumar and Mohammed Shami stifling the hosts. The two were right on the money in the first 10 overs, bowling an impeccable trajectory as they made the ball dance to their tunes to send back the Australian openers for just 26 runs. Aaron Finch was the first to fall, once again failing to read an inswinger by Bhuvneshwar, one that was pitched in the right spot on the pitch, getting Finch to come out and try to go for a drive, only to leave a massive gap between his pad and bat to castle win. Shami, on the other hand, rattled Carey with a brute of a bouncer, one he had no idea of how to negotiate. However, it was from there on that Australian held the fort, steadying the initial collapse with well-worked partnerships throughout the entire middle order. Shaun Marsh, the centurion for them kept batting at one end, getting able support from his partners as Australia put on three consecutive 50 runs partnerships to come right back into the game and go onto post a healthy total. Mohammed Siraj was the one who the Australians took a particular liking to. His uninspired and erring line and length, one that saw no variations was taken apart by Marsh, Maxwell and Handscomb, who hit him all around the park. 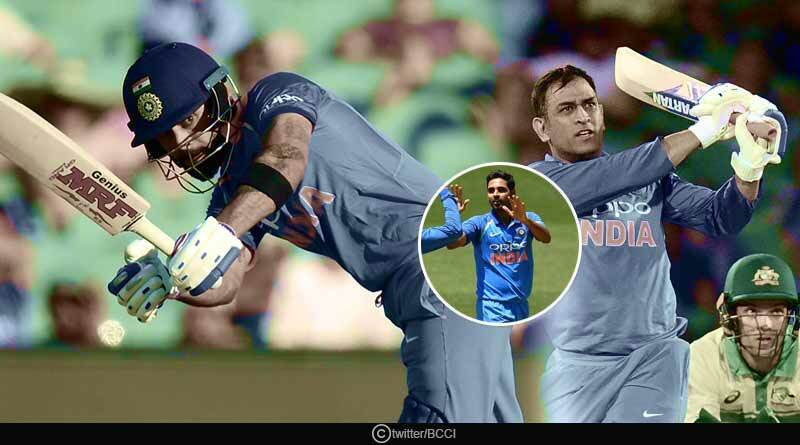 With no option other than of a sixth bowling option up his sleeves, Kohli was forced to see out Siraj’s entire quota of 10 overs which were battered for 76 runs, breaking India’s back in what was an otherwise exceptional and sensational effort by their frontline pace duo of Bhuvneshwar and Shami. From what looked at one stage to be a certain 300 plus total for the home side was held back by Kumar and Shami courtesy of an extremely well-delivered three overs that saw the innings fall apart for Australia in the final three overs. They went onto losing 4 wickets for 5 runs, bringing India right back into the match to see them go into the break, marginally the happier of the two sides. The chase started for India in a decent enough style with Rohit Sharma and Virat Kohli taking charge of the chase after Dhawan had departed early on. While Kohli slowly and steadily built his innings at one end, Sharma kept the scoring going from the other to bring up the half-century partnership for the third wicket. His wicket at 43, however, was a huge setback for India with the incoming Rayadu far from asserting in his innings, mistiming the ball throughout his short stay at the crease. However, Kohli was in no mood to let go of the match. He was in an imperious and meticulous spirit on the day and once he had applied himself in the middle, there was no moving him from his crease. The fulcrum of India’s chase, Kohli took the onus on himself to ensure India never fell too behind the required run rate, hitting an expansive range of shots. His partnership with Dhoni was the one that ultimately won India the match. Bringing up his 24th century while chasing, a record, Kohli departed soon after to break hearts not only throughout the country but back home in India as well. He left at a stage when the side still needed 57 runs off the final 6 overs and it looked like India may have finally lost their way on course to the win. Luckily for the side, Dinesh Karthik walked out and played an extremely well-played cameo of 25 runs off 14 balls. His onslaught ensured Dhoni could up the scoring rate from the other end as well, hitting two sixes to take India to a relatively easy win in the end.